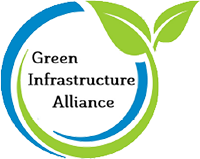 The Green Infrastructure Alliance (GIA) is a multi-disciplinary grass-roots organization whose mission is to unify green-industry and municipal professionals in an effort to develop functional environments that contribute to economically viable, healthy, livable communities. Founding members of the GIA include representatives from the nursery and landscape industries, landscape architects, municipal and county planners, municipal foresters and arborists, utility companies, and academia. GIA’s vision is to advance the adoption of research-based green infrastructure policies and technologies across multiple green-industry and municipal disciplines. Share knowledge and encourage the use of emerging green infrastructure policies and technologies among green industry and government professionals. Best Green Infrastructure Practices for Urban Landscapes: Site Plan Review.